I don't like ash pans in stoves. I know most stove buyers demand them, but most of the ones I've used has been fussy and messy and too hot to touch. Plus, it is easy to forget to empty them often enough so they overflow and really make a mess. My two previous stoves had ash pans in their pedestals that never had ash in them. The dumb plug in the floor of the firebox was never even lifted. I have developed another strategy that is quicker, more effective, and absolutely dust-free. I also like to keep a clean firebox. I find that if I don't empty a little ash roughly every other day of cold weather full-time heating, by the end of the third day the ash starts to interfere with my stoking technique. The way I handle my ashes is a direct result of that stoking technique, which involves raking hot coals to the front of the firebox and placing the new load of wood behind them. This raking moves the heat source for ignition to the place where the combustion air and the fuel are, just inside the loading door. The result is that I usually have ignition almost instantly. And the coals never get smothered by new fuel. 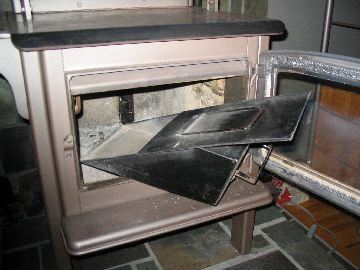 When I get up in the morning, the first thing I do is put coffee on, then I go to the wood stove. The hot coals from the overnight fire are always found at the back of the firebox of this non-catalytic stove. Because of the raking technique that I had used several times the day before, there is always an accumulation of ash at the front, just inside the door. I use the rake to consolidate this accumulation and then use a wedge-shaped scoop with a sliding lid to pick them up. The original device shown here was called an Ash Trap, but it is no longer available. There are variations available most places such as this one and this one, although the designs are not nearly as good as the original. Using the scoop means that I don't make dust shoveling ash into a bucket. Instead, I slide the lid closed before removing the scoop from the firebox. Voila!, no dust. Two quick jabs with the scoop, which doesn't disturb the coals, close the lid and carry the ashes to the back door where a small steel garbage can waits to receive them. Removal of the ash takes about 30 seconds and is such a quick and simple job, it is not worth putting off. Back at the stove, I rake the coals forward, put in a load of wood and have a bright fire burning in seconds, long before the coffee is ready. Lots of people find that removing ashes with a shovel and bucket releases a lot of ash dust into the room. But dust can be avoided if you follow a few simple guidelines. First, don't wait until the stove is cold to remove ashes because you need to rely on chimney draft to draw dust back into the stove. The time to remove ash is first thing in the morning while there is still some live charcoal at the back of the firebox so there is enough heat to produce some draft. Second, use a small shovel or large gardening trowel to transfer ashes into a bucket. A shovel that is too big will probably be too awkward to manage. Third, use a small bucket that you can hold right at the stove door opening. Large buckets are too hard to handle. Besides, ash shouldn't be stored in the same bucket used for removal. The small pail used at the stove should immediately be emptied into a metal garbage can stored outdoors on a concrete surface away from combustible material. That's it. Ash removal doesn't need to be a big deal or create a dusty mess if you use these methods.